The 152nd edition of the revered tome comes complete with events of the last year and, as usual, many fascinating articles. Moeen Ali, one of the elite Five Cricketers of the Year in his first full international season, takes pride of place on the front cover. 2014 was not a good season for England and editor Lawrence Booth writes about how English cricket lost touch citing the handling of the Kevin Pietersen dismissal, the replacing of Alastair Cook as ODI captain as well as the decline in playing numbers and Test match crowds outside of London. After Mooen Ali, the other Cricketers of the Year making up this year’s quintet are Gary Ballance, Adam Lyth, Jeetan Patel and Angelo Matthews. For the first time, Wisden has introduced the Leading Woman International Cricketer of the Year and the first recipient is the Australian captain, Meg Lanning. Joining Virender Sehwag, Kumar Sangakkara becomes only the second cricketer to be awarded the prestigious Leading Cricketer in the World twice. It can again be taken as read that the quality of the coverage of all cricket played around the world, both internationally and domestically, is of the highest order with excellent accompanying photographs. Phillip Bailey again oversaw the exemplary and fascinating statistics. The wide-ranging articles range from the extremely sad to the humorous. Phillip Hughes is given a fitting tribute after his tragic death at the end of November 2014. Gideon Haigh gives the reader an insight into cricketing nicknames down the years whilst details of the weather and legal wrangles also make the Almanack. With 2014 being the centenary of the outbreak of the Great War, a supplementary obituary section appears for those whose names did not appear after their deaths in previous editions. This was inspired by Andrew Renshaw’s supreme book, Wisden on the Great War, brought out in 2014, which ensured that those cricketers, even at lesser levels, were not forgotten. The usual Obituaries section is, as always, extensive. Cricket is very much a global sport and, whilst some countries attract more publicity and are more well-known than others, the section Cricket Round the World, is a fascinating section on what happened in less well-known corners of the cricketing world such as Vatican City, Montenegro and on Mount Kilimanjaro. Opening bowler Castro might correctly suggest Cuba but who knew that his opening partner is called Stalin? The index to Unusual Occurrences is, as ever, also terrific fun for bizarre happenings. 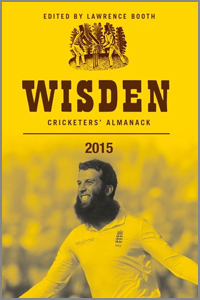 Once again, the 2015 Wisden is a must for all cricket fans.